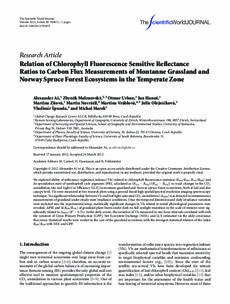 We explored ability of reflectance vegetation indexes (VIs) related to chlorophyll fluorescence emission (R686/R630, R740/R>800) and de-epoxidation state of xanthophyll cycle pigments (PRI, calculated as (R531 − R570)/(R531 − R570)) to track changes in the CO2 assimilation rate and Light Use Efficiency (LUE) in montane grassland and Norway spruce forest ecosystems, both at leaf and also canopy level. VIs were measured at two research plots using a ground-based high spatial/spectral resolution imaging spectroscopy technique. No significant relationship between VIs and leaf light-saturated CO2 assimilation (AMAX) was detected in instantaneous measurements of grassland under steady-state irradiance conditions. Once the temporal dimension and daily irradiance variation were included into the experimental setup, statistically significant changes in VIs related to tested physiological parameters were revealed. ÄPRI and Ä(R686/R630) of grassland plant leaves under dark-to-full sunlight transition in the scale of minutes were significantly related to AMAX (R2 = 0.51). In the daily course, the variation of VIs measured in one-hour intervals correlated well with the variation of Gross Primary Production (GPP), Net Ecosystem Exchange (NEE), and LUE estimated via the eddy-covariance flux tower. Statistical results were weaker in the case of the grassland ecosystem, with the strongest statistical relation of the index R686/R630 with NEE and GPP.